With a combined durability, attractiveness and versatility, Burlingham Sports has made this Stacker the ultimate jump system. This multilevel "Stacker" is made of UV stabilized polyethylene for bright long lasting color. This jump system is a lunging aid and an easily portable obstacle for all disciplines allowing you to create a single jump, an oxer, a coop, a triple bar or a complete bounce exercise. 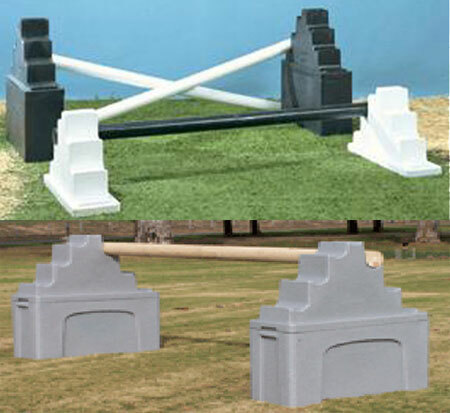 Also, a wonderful training tool allowing you to build a jump from 6" to 2'0" or up to 3'6" with the stand. Set the poles on the off side of The Stacker so they will roll off when knocked. For a wide variety of training uses, use multiple Stackers to give you endless possibilities. These are a must have for every horse owner! You can choose from The Stacker, The Stacker & Stacker Stand Combo or the Stacker Stand. All come in pairs. Also, any of these Burlingham Sports Stacker, Stacker & Stacker Stand Combo and Stacker Stand of your choice will be drop shipped from the manufacturer straight to your door! Choice of Stacker, Stacker/Stand Combo or Stacker Stand. Build jump from 6" to 3'6" in 3" increments. Made of UV stabilized polyethylene.